Russia and Caucasian Tribes: What's the deal? How can the Russian player deal with the Caucasian tribes? Many of them (the Kuban, Chechens, Azerians, etc) are at war with Russia on the map from the beginning, yet they are diplomatically at peace so they cannot sign a peace treaty. So how can Russia pacify them, what are the mechanics exactly? What if the player occupies all the towns, but the rest of the countryside remains under their control? Re: Russia and Caucasian Tribes: What's the deal? What do you mean, they are "at war with Russia on the map"? It's been a while since I played WON, but when I did, I was playing Austria/Russia, so I had some dealings with the Caucasus. I recall simply keeping the cities, and trying to get Azerbaijan to give me the regions with the roads I needed. I don't recall really doing anything with the tribes in the eastern Caucasus. They left me alone, and I left them alone. But I also never played an entire campaign; mostly testing and the first years. Captain_Orso wrote: What do you mean, they are "at war with Russia on the map"? I know I am also at war with the Chechens because I captured Grozny, yet in the diplomatic screen, I have a Passage Right treaty with them. Your relationship is so abysmal that you are practically at war, without having de jure declared it. That happens with all unorganized nations I believe. Interesting, good to know. However, normalizing these bad relations simply with State Visits would take a long time. Are there other options, besides taking their bases and holding until relations are diplomatically brought to neutral? Also, does holding these towns and outposts have an influencing ownership towards Russia in neighboring country areas? I'm not sure if that is the fact, but IIRC, factions lesser than minor factions (tribes, etc.) do not follow the same rules as minor factions and above. For example, if you do not have a treaty in place, your forces cannot enter a minor faction's territory. 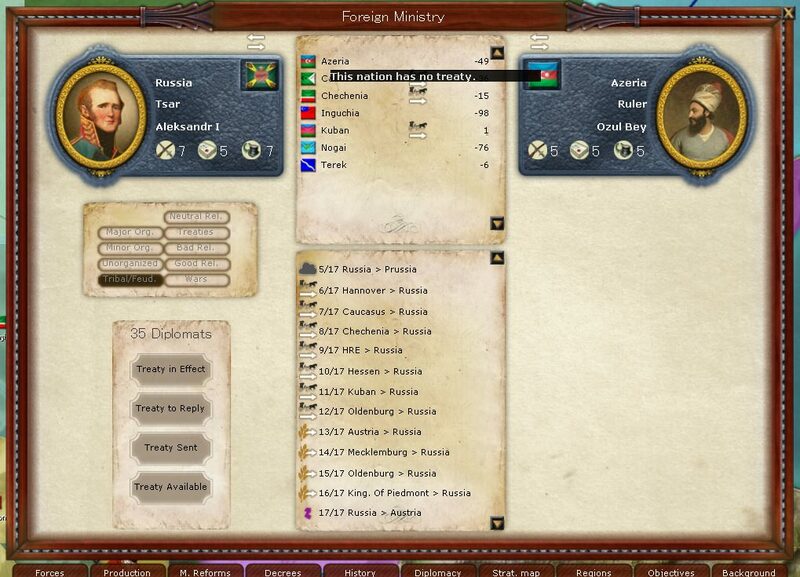 But Azerbaijan is a minor faction (its flag and leader appear on the diplomacy page. It doesn't seem logical to me that simply having poor relations with Azerbaijan would allow Russia to move through Azerbaijani territory, but I don't actually know. Maybe they have minor-minor status and are between tribes and minor factions, but I'm just guessing.